Research shows that 71% of couples will be pregnant within five years. If you're struggling with infertility, you've probably spent countless hours researching available treatments. But with financial, emotional and physical risks involved, there's likely one glaring question on your mind: What's the likelihood that these treatments will actually lead to a baby? A recent study aimed to answer that question exactly. According to the study, led by researchers at Copenhagen University Hospital, most people will find fertility treatments like IVF effective. 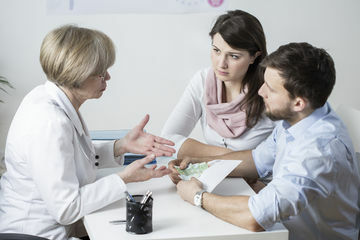 In fact, after analyzing nearly 20,000 couples, the team found that over half of all couples were parents within two years of starting treatments, and 71 percent within five years of treatment. The findings were presented at the European Society of Human Reproduction and Embryology. And according to research, there's one important factor in determining the effectiveness of fertility options: age. For women under 35, there was an 80% chance of success over a five-year period. The rate fell off to 61 percent in women aged 35 to 40, and further still to 26 percent in women over 40. The odds also rest on sheer frequency. Sometimes a first try won't be successful, but the second or third attempt will. "There is a very good chance of having a child, even if you have difficulties conceiving on your own," Dr. Sara Malchau, one of the study's researchers, told BBC News. "Most causes of infertility can be overcome, but age is the most important factor to predict if treatments are going to be successful or not." Age isn't the only factor, according to Dr. Malchau. "Also, women with a body mass index under 30 had better outcomes as well as women who didn't smoke," she said.